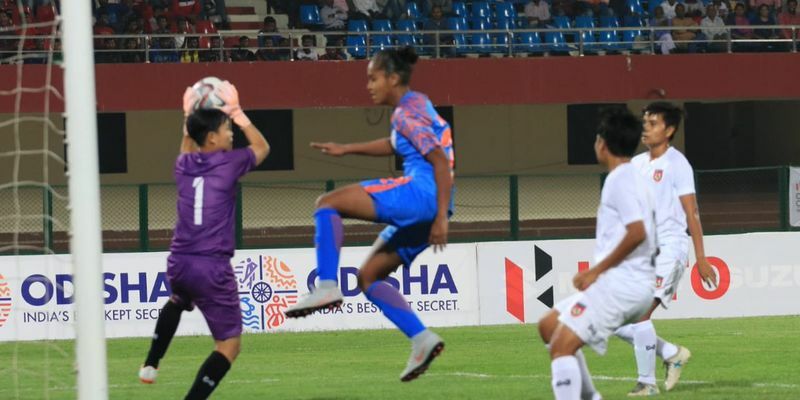 India women suffered their second successive defeat of the tournament as Myanmar won 2-0 in the last round-robin match of Gold Cup football tournament on Wednesday. Nepal also beat Iran by 3-0 goals to secure a place in the final which is scheduled to be played on February 15 against Myanmar. July Kyaw scored the opening goal of the match in the second minute itself and it was Win Theingi Tun netting the second one in the dying minutes to seal a win for the Myanmar side and help them qualify for the final of the Gold Cup. India responded strongly after conceding an early goal and increased the intensity of their attacks up front. Sanju Yadav came close to score an equaliser in the 13th minute of the match after cutting in from the left side and attempting a shot at goal but Myanmar custodian Zarzar Myint tipped the ball over the crossbar. The Myanmar side heavily relied on counter attacks and they almost doubled their lead when Win Thengi Tun latched on to a loose ball and laid it off for her captain Khin Marlar Tun. However, the latter’s shot went inches wide from the goalpost. The hosts also had another golden chance in the last 10 minutes when Dalima’s cross was fumbled by Myanmar keeper Zarzar, before Sanju managed to get in between two defenders and plonk it into the goal. However, the referee had already blown his whistle for a foul in Myanmar’s favour till then. But unfortunately, seconds before the final whistle, Indian defender Jabamani Tudu brought down Win Theingi Tun inside the box and gave away a penalty. Tun scored to make it 2-0 for the visiting team. The Indian women suffered their second successive defeat and thus crashed out of the tournament. While Myanmar, on the other hand, reached the final after winning all the three matches in the league stage. They will face Nepal in the final match on February 15.